I don’t pretend to know what suffering is like. That’s what I’ll tell you on any given day. On any other given day, I might tell you that I have experienced a great deal of suffering and that it’s more than I can bear. One moment, I feel like I can’t go on, and the next moment, I laugh at myself for thinking that I have any suffering to speak of. I cannot imagine looking in the face of someone who has a terminal illness or a life-altering injury or a death in the family, and even thinking to mention the relatively minor chronic pain I experience day-to-day. 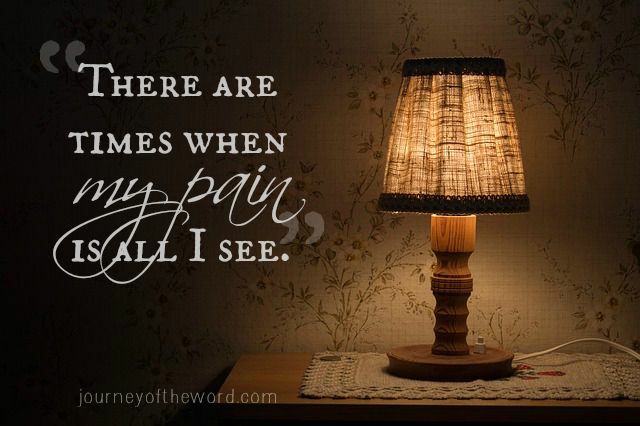 And yet, there are times when my pain is all I see. Without a doubt, God has carried me down a winding, rugged path of questions and groanings in regard to the physical suffering I know on a regular basis. I have only just begun to attempt to speak about them. To formulate thoughts and to consider reasons and to rest in the work he is doing. It is no easy task. But a peculiar concept God gave me one day was a lesson I never expected. He didn’t say to me, “You just need to trust me.” He didn’t remind me to allow him to carry the weight of it all. It wasn’t that he wanted me to see my suffering as a part of his plan that I simply must accept. A “thorn in the flesh” about which I must plead earnestly. No, I had already been told all those things by one concerned party or another. But that day, it was a new and strange lesson. Your suffering is a gift. A gift. A privilege that few experience. If suffering takes you to a precious place with God that nothing else does, who wouldn’t want it? That day, my perspective turned a corner. I had worked for so long to try to ignore my pain. I wished I could forget about it, dismiss it, move beyond it, redirect my life accordingly, and pretend like nothing ever happened. And now, by God’s grace, I daily force myself to accept the good gift God has given. I say “force” because it doesn’t come naturally. But oh the joy it brings to this honored recipient. Funny. I think the first thing we do when we read this passage is to compare our sufferings with the glory to come. At least that’s what I did. Get this. The glory is so great, the suffering falls out of the equation. Now that’s a thought for a weary soul. And so I take a step back. While I may have the “ability” to see my suffering as gift, I’m not sure I see it as so minuscule in comparison to the glory to come, that I don’t even compare the two. How I pray for eyes to recognize a gift so graciously granted to me on this earth: my suffering. And when you ask me about my gift, please remind me that I shouldn’t bother comparing it with glory. Solomon said there is wisdom in the house of mourning and the beautitudes say that those of us who hurt are blessed. Some translations even say, ‘happy’. It is because God does not leave us this way. He is closer to us than a brother. I believe also the verse that says, ‘And I will give thee the treasures of darkness,’ It hurts to be in the house of mourning, but I believe, because of God, there are good things there to those will find them. And yes, the weight of glory, how wonderful it must be. Thank you for sharing. That’s true though. We usually get blinded by pain and we focus on it. Wallow even. It’s always wise to take off our blinders, take a step back and look at the situation from a 3rd person’s perspective. Then we’ll see clearer. “The glory is so great, the suffering falls out of the equation.” You have given me something to think about today. A needed shift in perspective. Thanks for sharing on #intentionaltuesday! I was just talking to a friend yesterday about how minor our sufferings feel in the face of others struggles. Thanks for the reminder about how minor they ARE in the face of our heavenly glories! Wow! What a wonderful perspective to be able to have and hold onto in times of suffering. Good for you!